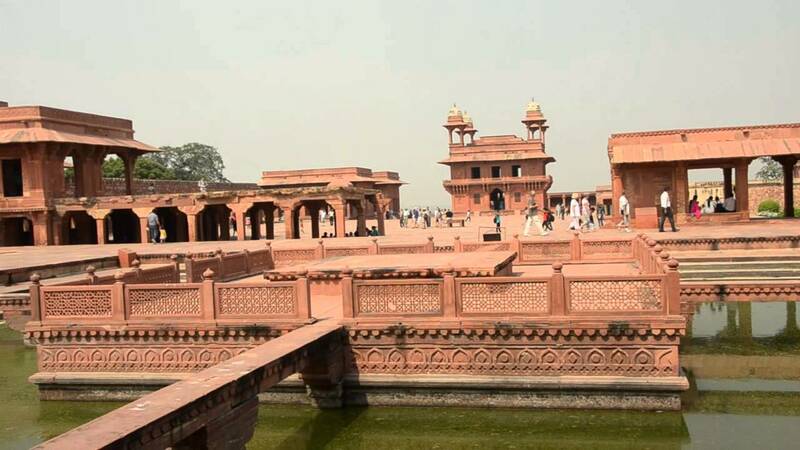 Fatehpur Sikri is situated in Agra in the state of Uttar Pradesh. Akbar, Mughal Emperor was founded the city in 1569 and declared as the capital city of the Mughal Territory between 1571 and 1585. The structure of the Fatehpur Sikri was based on Mughal architecture. 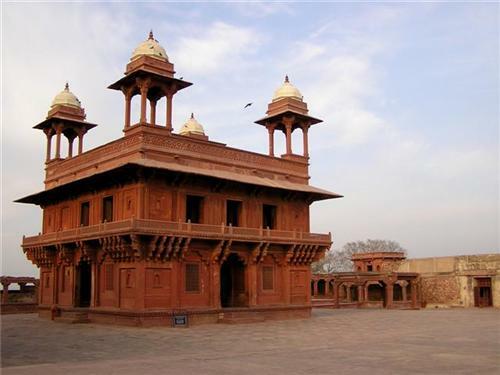 There are many forts in Fatehpur Sikri which is made up of red sandstone. The red sandstone is also called as “Sikri sandstone.” The dimension of the monument is around 3kilometres (1.9miles) and 1km (o.62 miles) which is surrounded by a 6km (3.7miles) wall in three sides and last side is surrounded by a lake. It has several entrances which is about 5 miles (8.0km) long fort wall such as Delhi Gate, the Lal Gate, the Agra Gate, Birbal’s Gate, Chandanpal Gate, the Gwalior Gate, the Tehra gate, the Chor Gate and the Ajmere Gate. It was constructed by Akbar which is based on Mughal architecture in 1601 A.D for honour his win in Gujrat and is about 43km away from Agra. 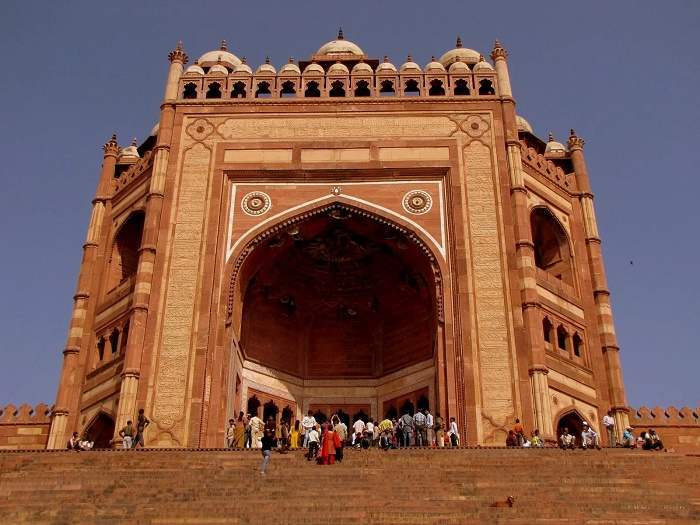 Buland Darwaza is the main entrance in the Fatehpur Sikri and it is the uppermost gateway in the world. The size of the Buland Darwaza which is located at Fatehpur Sikri is about 55 metres (180ft) high. The structure of the Buland Darwaza is made up of red and buff sandstone which is adorned by white and black marble. 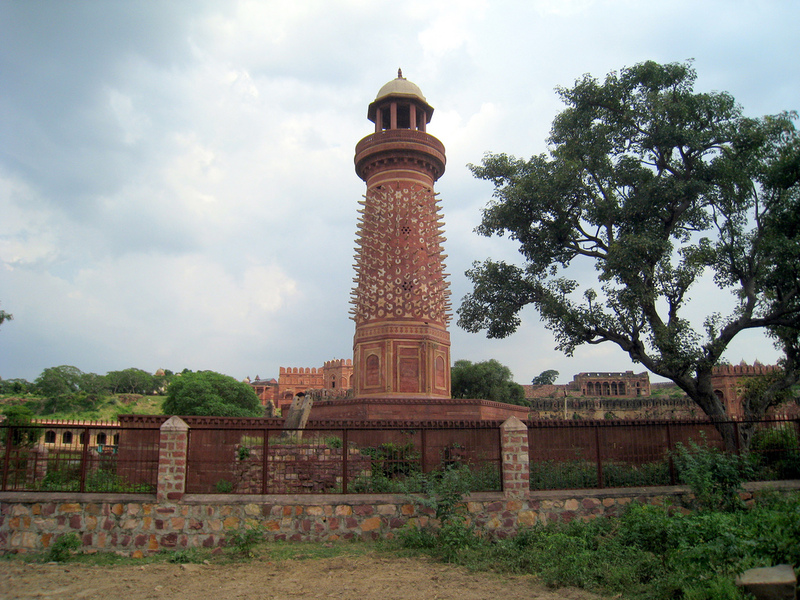 The monument is a 15-storied high gateway which is the southern entrance of the Fatehpur Sikri. The monument has three kiosks located in uppermost that are bounded by thirteen smaller domed kiosks. The gateway is surrounded by the small turrets. The plain red sandstone is bordered with a white marble and a flower like decorative design inlaid in white marble which is located at the top of the arch. The height of the gate is 176ft from the ground. Jama Masjid is placed at the opposite side of the Agra fort. It is a 17th Century mosque and built by Shah Jahan in 1648 which is based on Iranian architecture, devoting to his loving daughter, Jahanara Begum. The masjid is also called as the Friday Mosque. Mostly tourist visited the mosque in Agra and it is one of the largest mosques in India. The masjid has a central cave which has a single dome, two colonnaded halls, and two square chambers crowned with domes. Its marks the stage of change in Islamic architecture was mixed with Persian design. The Tomb of Salim Chishti was built between the 1580 and 1581 with the funeral place of the Sufi Saint, Salim Chishti (1478 – 1572), a successor of Khwaja Moinuddin Chishti of Ajmer. The Tomb was built by Akbar for the Sufi Saint due to his prediction the birth of son of Akbar. The name of the son of Akbar is Prince Salim who is the successor of Mughal Empire after Akbar. The construction of the tomb is based on the Mughal architecture. It is also called as Hall of Public Audience is that place where the King meets the general people. This monument is situated in several cities. It is also called as Hall of Private Audience was used by the Mughal rulers to entertain their foreign dignitaries, ambassador and kings. This hall was also used for debate the problem in privacy with his representatives of different religions leaders. The hall was built by Mughal Ruler Shah Jahan in 1635. It is also called as House of Worship which was built by the Mughal Emperor Akbar in 1575 CE in Fatehpur Sikri. This monument is used as a meet with leaders of different religious for discuss the teachings of the individual religious leaders. Din-e-Ilahi were laid by Akbar. It is also known as “Jodha Bai”. She was a wife of the Mughal Emperor Akbar and her real name is Heer Kunwari, Hira Kunwari or Harkha Bai. 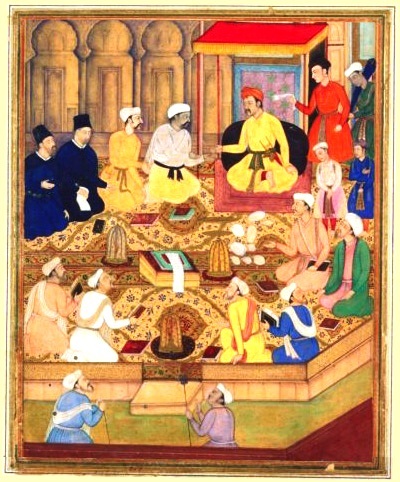 Akbar had given a title for Jodha Bai as a Marium-uz-Zamani Begum (Persian Title). She was the mother of Jahangir. It is also known as Naqqar Khana which means a drum house in which singer used drums for publicize the entrance of the Emperor and located near the Hathi Pol Gate or the Elephant Gate. It is a five-story palace in Fatehpur Sikri in Agra and also known as “Badgir” which means wind catcher tower, was built by sikarwar rajputs. This monument is near to the Zenana quarters (Harem) which was used for entertainment and relaxation. It is also known as Elephant Tower. This monument is a circular tower which is covered with stone projections in the form of elephant tusks. It was built as a memory for Ruler Akbar’s favourite elephant. 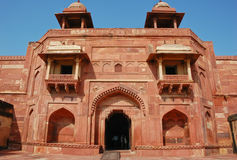 Fatehpur Sikri is around 39 kilometres (24 mi) from Agra. Agra Airport (also known as Kheria Airport) is the nearest airport, 40 kilometres (25 mi) from Fatehpur Sikri. Fatehpur Sikri railway station is the nearest railway station is around 1 kilometre (0.62 mi) from Agra. It is linked with Agra and nearby centres travel by road. The regular bus and private taxi services facilities for tourists. Anytime tourisis visits Fatehpur Sikri however November to February is the best season for visit the Agra and Fatehpur Sikri.